Your canvas ketubah will typically come to you unstretched -- that is, rolled up in a tube ready for stretching and mounting by your local framer. We now offer you the option to purchase your ketubah already wrapped or framed so all you have to do is sign it and display at the wedding and beyond! 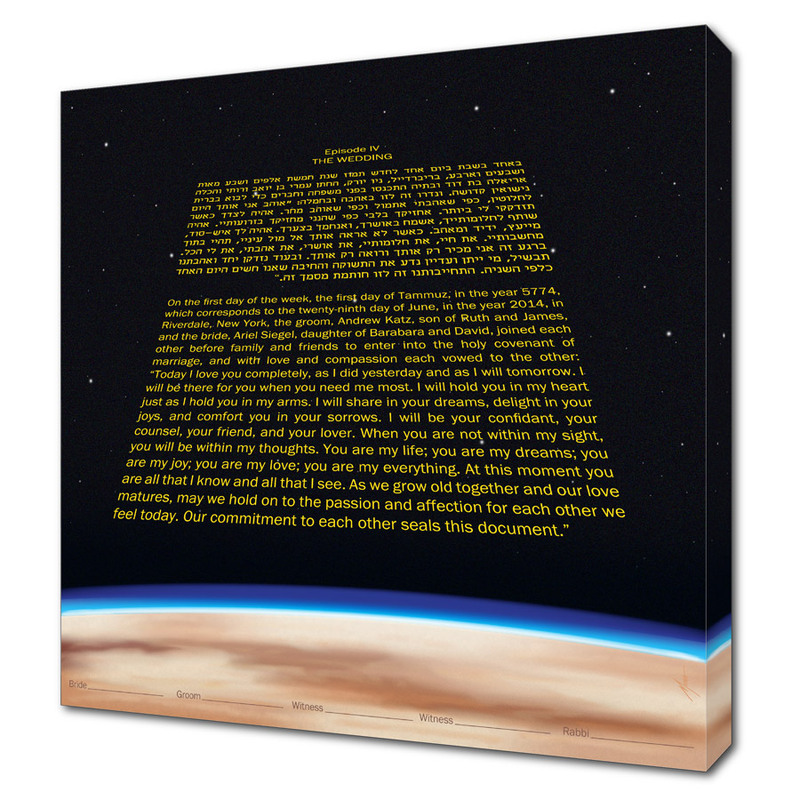 The most popular choice is to have your Canvas Ketubah finished with a Museum Wrap. Here, your ketubah design is centered, stretched and mounted on 1.5” stretcher bars and the white borders are wrapped and stapled on the back, giving the sides a clean, crisp look. On a gallery wrap, your ketubah design will be extended around the sides of the 1.5” stretcher bars. This choice is best for landscapes and abstract designs that will easily “flow” around the back. For the right designs, a Gallery Wrap looks contemporary and highlights the art. 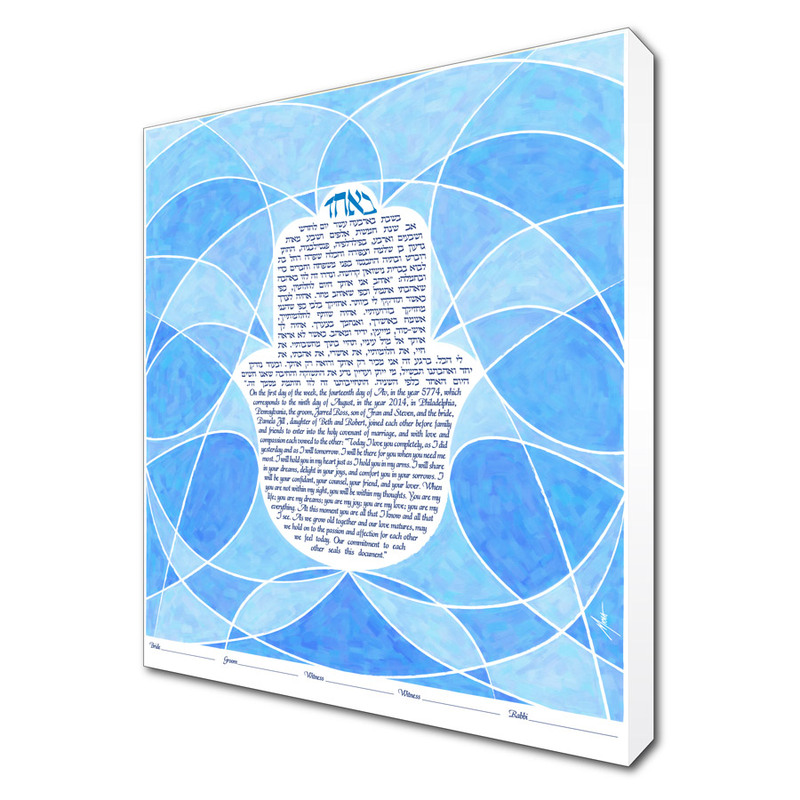 If you choose to frame your canvas ketubah, it will first be stretched and mounted on standard 3/4” stretcher bars, then framed without a matte or glass so that you can see the beauty of the canvas. The frames are available in 1” flat wood (black, cherry, natural, pecan, and walnut) or 1/2” rounded metal (black, gold, or silver). There is no more beautiful way to display your ketubah on your special day! You may choose from a Museum Wrap, a Gallery Wrap, or Canvas Frame. 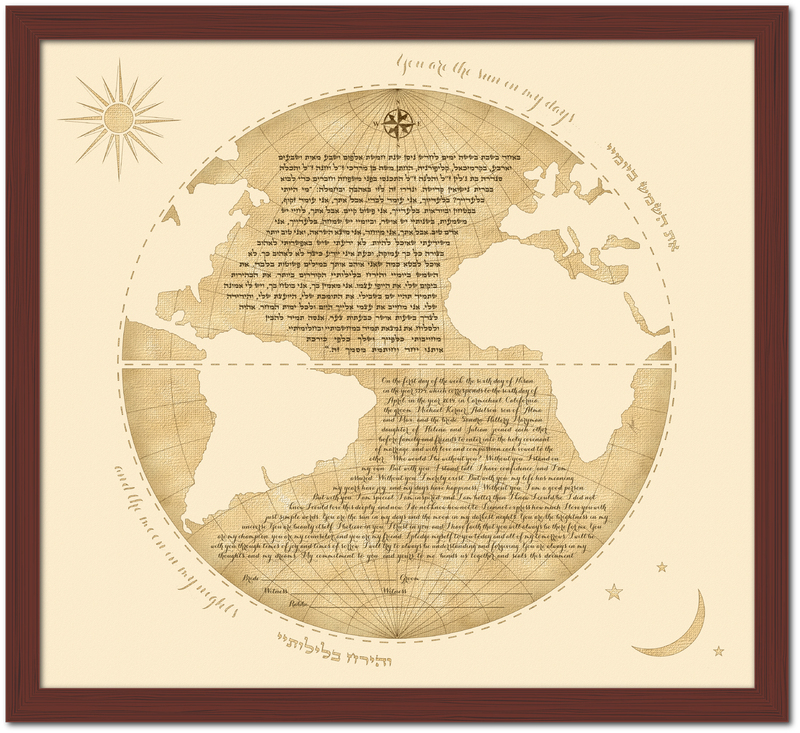 If you choose to have your canvas ketubah framed, we offer five different wooden frames -- Walnut, Cherry, Pecan, Natural, and Black -- and three satin aluminum frames -- Black, Gold, and Silver. If you wish to order a gallery wrap, you will be able to choose the option you like best during the checkout process in Step 3: Accessories when you're ready to order your ketubah. If you forget which one you liked best, don't worry. There is a link to the framing options. It is a good idea to purchase the option of your choice at the time you purchase your ketubah. We need to have the ketubah to wrap or frame it, so ordering them at the same time will eliminate the need and cost for you to ship your ketubah back to us. Or, you might wish to simply take your ketubah to a local framer to have it framed professionally. Framing generally adds an additional 2 weeks to the ketubah ordering process from the time you approve your proof, so count on 3 weeks total turnaround time plus shipping time. If your wedding is within a month, and you have your heart set on a frame, contact us, and we'll see if we can make it happen. For their protection, our paper ketubah editions need to be framed behind glass with a matte. With that in mind, our Premium Hinged Frame and Standard "DIY" Frame are available with 10 different matte colors so you can enhance the beauty of the artwork while you protect it. Please note that, because we are not a full-service framer, we sell our frames for our own ketubahs only. (That way, we control the entire process and, if something goes wrong, we can fix the ketubah as well). Therefore, we do not sell frames for ketubahs purchased from other companies.